Welcome! It's time for another monthly edition of Wendy's Favorite Things...a fun roundup where I share some of the best food and kitchen items that I've tried during the past month. I've got some great new finds to share with you this month, so let's get started! 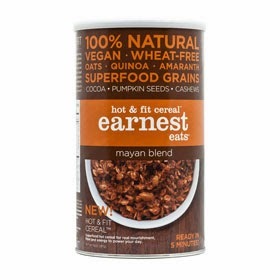 (1) Earnest Eats Hot & Fit Cereal. Now that the weather is cooler, we're starting to eat more hot breakfast cereal, and we love this Earnest Eats Hot & Fit Cereals! Their trio of tasty whole-food cereals are made with combination of superfood grains, including whole oats, quinoa and amaranth. Then they’re flavored with hearty nuts, toasty seeds and naturally-sweet fruits. These delicious cereals deliver nutrition and flavor! They’re available in multi-serve canisters and convenient single-serve cups that are great for on-the-go mornings. Flavors include American Blend, Mayan Blend, and the unique Asia Blend. Michael was a huge fan of the American Blend, which is flavored with cinnamon, dried cranberries, almonds and sunflower seeds. I’m crazy for the Mayan Blend, which is flavored with cocoa, pepitas (pumpkin seeds) and sunflower seeds. Not only do they taste good, Earnest Eats products are minimally processed, wheat-free and free of preservatives and artificial ingredients. (2) PoachPods by Fusionbrands. I love poached eggs for creating elegant weekend brunch dishes, but my poached eggs never came out picture-pretty in my kitchen. Until now, that is! 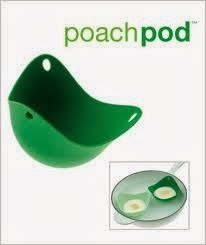 PoachPods are a genius kitchen tool made of silicone. Simply spray the wells of each PoachPod with a bit non-stick spray, crack an egg into the well, carefully lower the pod into floating water and cover. The pod will float on the surface and poach in about 10 minutes. The end result is a gorgeous, perfectly poached egg that’s totally photo-worthy and delicious! You can purchase PoachPods in a set of 2 for $10 at their website. They're also available at numerous retail locations, including: Sur la Table, Crate & Barrel and Bed, Bath & Beyond. 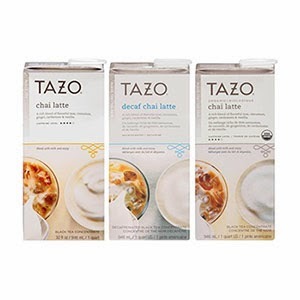 (3) Tazo Chai Tea Latte Concentrate. We’re both huge fans of spicy, exoticchai latte after first tasting it at The Doughnut Plant in New York a few years back. We’ve tried several brands of chai since then, but this is the very first make-at-home chai latte that has the perfect mixture of spice and sweetness that we like best. Now when we get a craving for chai latte, all we have to do is pour some of this flavored chai concentrate from the carton into a mug and add milk...or half and half. It comes lightly sweetened, but you can easily adjust the sweetness for each person’s taste by adding extra sweetener if you like. This versatile concentrate can be enjoyed warm or cold…but warm is perfect this time of year. Talk about simple! For $4.95, each carton of concentrate provides about 8 chai lattes, which is a great deal. (4) O Ultra Premium Extra Virgin Olive Oil. There are tons of olive oils on the market to choose from, so it can be really confusing to know which brands are the best. In my experience, it can be a frustrating hit or miss proposition. I recently tried this delicious California artisan olive oil, and I can personally vouch that it's fabulous! The oil's flavor is fruity and smooth, and the color is a beautiful rich green. This is the perfect selection when for you want the olive oil to take center stage in a dish. I used this olive oil in a homemade vinaigrette salad dressing, and the robust flavor worked perfectly. It's also great for simple grilled fish, where the fruity flavor of the oil can shine through. This Ultra Premium Olive Oil is made from pesticide-free Arbequina olives that are early hand-harvested on family farms. It’s also a Gold Medal Winner at the 2013 Los Angeles International Extra Virgin Olive Oil Competition. O Ultra Premium Olive Oil retails for approximately $15 per bottle. 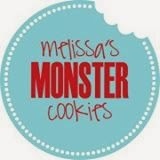 (5) Melissa’s Monster Cookies. These amazing cookies are naturally gluten free and are made in nearby Austin, Texas. These pre-baked cookies taste so great that even those of us who don’t have any dietary restrictions gladly gobble them up in seconds! After 5 minutes at room temperature, the cookies are thawed ready to eat. 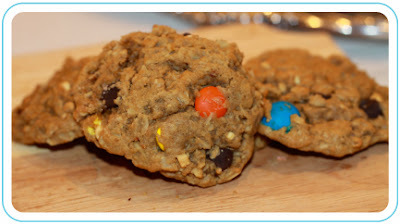 They’re moist and flavored with peanut butter, gluten-free oatmeal and fun chocolate candies. These cookies are only available in Texas at the moment and can be found in the freezer department at your local Central Market. Bottom line: these cookies are downright addictive! Everyone who I shared them with in my office raved about their flavor and texture. They have a homemade look, taste great and are high in fiber and protein. That's a winning combination, friends! (6) Papa Murphy Take 'n Bake Pizza. If you’re like us, Pizza Night is a regular occurrence at your house. Papa Murphy's provides a great alternative to pizza delivery: take and bake. You stop in their store, watch them assemble a customized pizza for you, then take it home to bake it fresh…when you’re ready. There's no waiting for delivery, and the pizza is hot and ready after a quick bake in a 425 oven. They even send your pizza home on an oven-safe cardboard baking pan. We gave their pizza a try last week, and we were very impressed with the ease of preparation, the flavor of the ingredients, and the quality of the crust. They're a convenient one-stop shop, offering fresh salads and cold sodas in addition to pizza. Here's a picture of our pizza being assembled at my neighborhood Papa Murphy's location, along with a look at the finished product. 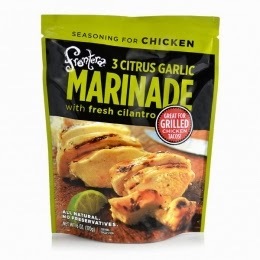 (7) Frontera Kitchens' Flavored Pouch Sauces. These Mexican cooking sauces from Chef Rick Bayless’s Frontera Kitchens is one of my favorite food finds of 2013. Each pouch is made with only flavorful all-natural ingredients – no funky preservatives. They let me cook up spicy tacos, fajitas, and grilled chicken and fish on busiest of weeknights. I featured their Garlicky Carnitas Slow Cook Sauce earlier this week. Honestly, every one of the varieties we’ve tried have been awesome…bursting with the big flavors we love. We especially love the Texas Original Taco Skillet Sauce and and the Three Citrus-Garlic Marinade for chicken pictured above. These sauces help me whip up a delicious dinner in an hour less thanks to streamlined prep. (8) Elaine’s Toffee Company. 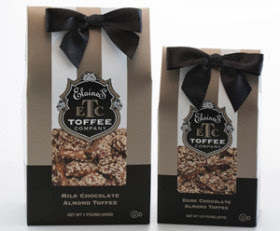 If you love toffee, you’ve simply got to try Elaine’s! Elaine is the mother of the company’s founders. Her signature toffee recipe was so popular with family and friends that they encouraged the family to start selling it…so they did. The toffee is buttery and easy-on-the-teeth. It comes in several varieties, but my favorite is the Milk Chocolate Almond. A piece makes a great after-dinner treat. They also make a decadent Toffee Sauce that’s great with ice cream and the best Peanut Toffee Brittle I’ve ever eaten. It’s salty-sweet and you won’t risk breaking a tooth eating it! To find this delicious toffee at a store near year, visit their Store Locator. As an added bonus, the packaging is gorgeous…making it a great idea for holiday hostess gifts. Disclosure: The companies that produce the items featured in this article provided me with samples of their products to facilitate inclusion. I received no further compensation, and all opinions expressed are my own.